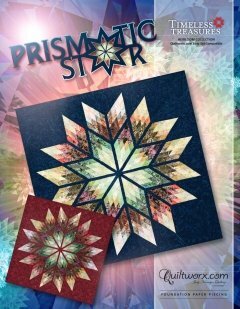 The Prismatic Star was created to show how an exploded star could be paper pieced using the (48) 2-1/2” strip packages that Quiltworx.com has created for use with a number of its strip pieced quil tdesigns (the Cover Quilt is shown in 2-1/2” Strips by Timeless Treasures). Strips are sewn onto foundation paper to complete what we call a ‘Strip Set’. After the strip sets are completed, they are cut apart, rearranged and resewn into a diamond star point. The process originated by combining two previous published techniques used in several of the Lone Star and Bali Fever quilt designs by Quiltworx.com. The foundation papers, layouts, and strip piecing processes were designed by Brad and Judy Niemeyer for foundation paper piecing.